Bosnia-Herzegovinaai??i? ?s debut in World Cup ai?? ?a victory for footballai??i?? Despite a disappointing exit in the group stages of the World Cup, Bosnia-Herzegovina national football team brought a smile on the faces of their long suffering countrymen. Bosnia-Herzegovina wrote a new chapter in their history as they qualified for their first World Cup in Brazil after years of pain and sufferings caused by war and other tragic mishaps. 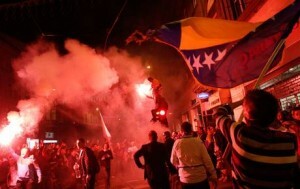 When Bosnia-Herzegovina sealed qualification with a win over Lithuania, the capital city of Sarajevo erupted. The victory meant so much more than just a ticket to Brazil for a country still recovering from the wounds of war. Beyond the normal craziness which surrounds a World cup qualification, this event bore a much bigger potential for the young country, torn by the 1992ai??i? ?1995 conflict and struggling with inter-ethnic divisions. This is a country which recovered from a ferocious war 19 years ago. Just days after the Dayton Agreement was signed ending the cruel war that took more than 100,000 lives, Bosnia-Herzegovina arranged their first official national team match in a situation which can be best described as crazy with only nine players boarding the flight to Tirana as Sarajevo was still under siege and the footballers found it difficult to travel for the game. A Bosnian team graced the international stage for the first time in Tehran against Iran in 1993, represented by a team from FK Sarajevo who played as “ambassadors” for the new nation while their city was under siege ai??i?? and won 3-1. Coincidentally, Iran was the team Bosnia met in their last group-stage game in Brazil and won 3-1. 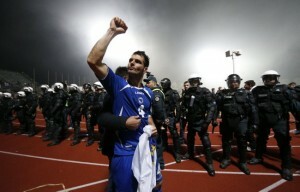 After recognition by Fifa, the official Bosnia side came up against Albania which they lost 2-0. The team slowly grew stronger but missed out on qualification for the Euro 2004 finals in Portugal, finished third in their group for the 2006 World Cup qualifiers and were second to eventual champions Spain in 2010 qualifying group. But this time they finally made history hen Bosnia and it was greeted by massive crowds of 50,000 fans who filled the streets of Sarajevo. It was a moment of utmost joy and relief for the long suffering faithfuls of the national team who did not miss this opportunity to come together and celebrate the historic occasion. Football plays an ambiguous role in Bosnian society in strengthening the state and spreading harmony among the multi-ethnic groups. The end of 1980s, saw a strong political force grasping the football organization in Bosnia and was used a tool by nationalists for personal gains. When the war broke out, individual ethno-national group segregated their own separate football federation and football league. The Bosnian Serbs and Bosnian Croats supported the Serbian and Croatian national teams respectively .Strong pressure from both FIFA and UEFA forced Bosnian and Croatian federations to merge in 2000 and they were joined by Football Federation of Republika Srpska later in 2002 which led to the formation United Football Federation of BiH and one common Premier league was established. UEFA imposed sanctions in April 2011 barred Bosnia from playing any official matches until there was an overhaul in the structure of its football association. The suspension imposed strict deadline on the FA to put forward the reforms or suffer the consequences of falling behind the other nations. For the reform to pass however, it needed to be unanimously accepted by both the parties involved (the Federation of Bosnia and Herzegovina and the Republika Srpska) but the agreement seemed far away which would have jeopardized the chances of FK Borac Banja Luka (from the Republika Srpska) from appearing in the coveted UEFA Champions league qualifying games . The club would have been banned from competing in the tournament without the implementation of the reforms which indirectly provided the boost for the reforms were passed without a hitch. For once in Bosnia, the people won. Bosnia was re-admitted after the political figures in the federation were sacked, the board took a swift decision in appointing Yugoslavia and Paris St Germain legend Safet SuA?ic as the coach of the national team. Ivica Osim who was the last person to serve as head coach of Yugoslavia played a crucial role in shaping the future of the Bosnian national team. Previously he guided Yugoslavia to the quarter finals of the 1990 World Cup in Italy before quitting two years later as his hometown, Sarajevo, came under siege. He also led them to the 1992 European Championship but as the war broke out, Yugoslavia were banned from the tournament even before it started. Their last-minute replacement, Denmark, famously went on to win the trophy. Bickering and squabbling among the country’s three main ethnic groups left the country’s football association on the brink of expulsion from FIFA. Osim who had always refused ethnic labelling brought the organisation back into shape with his strict approach and his long-term vision set the stage for Edin Dzeko and his team-mates to play some of the most compelling football of any of the qualifiers. The unified Bosnian Premier league opened avenues for the football fans to travel to ethnically different towns and renewed encounters of people who were separated long time ago by the conflict. The Bosnian national team became more multi-ethnic over the last decade and have gained the support of Bosnian Serbs and Bosnian Croats as well. The countryai??i? ?s first truly multi-ethnic organization can be seen on the football pitch with stars such as Edin DA?eko and Asmir BegoviAi?? (ethnic Bosniak) and Zvjezdan MisimoviAi?? (ethnic Serb) coming together for the national team which sends a strong message of unity and cooperation and presents itself as a source of national pride. There can be no ethnic disapproval against a pass out from defence by Croat Toni Ai? ?unjic to Bosnian Serb midfielder Zvjezdan Misimovic, and then to superstar striker DA?eko, a Bosniak. The power of football to act as a bridge towards reconciliation should in no way be underestimated. The multi-ethnic structure of the squad is a proof of the fact that co-operation is possible among the three predominant ethnic groups in the country. There was no discrimination between a Muslim and an Orthodox Christian on the football pitch. Miralem Pjanic (an ethnic Bosniak) will not refuse a pass from Miroslav Stevanovic (an ethnic Serb) because of the events that took place while they were teenagers and were far beyond their control. The understanding between goalkeeper Asmir Begovic (an ethnic Bosniak raised in Canada) and defender Emir Spahic (an ethnic Bosniak born in Croatia) ensured a rock solid defence that let in only 6 goals in qualifying campaign. The national team has not only come as a welcome relief for the fans but now it has presented itself as a model to follow in front of the rest of the country, and also for the international community. The board regularly got themselves in a mess thanks to corruption and ethnic political disagreements at the higher levels which led to a number of players refusing to play for the national team until the problems were addressed. The international media portrayed Bosnia-Herzegovina as a war-torn country that rose from the ashes and was leaving its past behind for a new dawn; the players are represented as ai?? ?the children of the warai??? who are the faces of Bosniaai??i? ?s golden generation. The debut participation at the FIFA World Cup has increased their visibility in international media for the Bosnians which is important for small or less powerful states that do not often get the limelight. Comparisons can be made with Croatia, who arrived at the FIFA World Cup in 1998 as virtual unknowns just seven years after the declaration of independence, and announced their international presence through securing the third place in the tournament. Being at the centre of the global attention represented a source of national pride and self-confidence, which the Bosnians lacked otherwise. The conclusion drawn from the post- World Cup media analysis is it has mainly two social meanings for the Bosnians: i>potential to be a tool for national/inter-ethnic reconciliation; and ii>a source for increasing the presence of BiH in the international community. Football as a favourite sport of the three ethnic groups, and the World Cup as ai?? ?opium of the massesai??i?? can therefore serve as a soothing balm for the war ravaged and flood hit country. It is questionable what the long-term effect of the World Cup will be for Bosnia. They recently experienced the most terrible floods in its history which brought the people together irrespective of their ethnicity or religion, and sportspersons from Bosnia, Serbia and Croatia (DA?eko, A?jokoviAi? ?, even IbrahimoviAi?? from Sweden). All Bosnian football clubs joined hands for this cause which was quite a landmark in Bosnian history. Miralem Pjanic went to a pharmacy and bought its entire stock for donation. The team toured the flood affected areas, including devastated Maglaj and played charity matches for this cause. The importance of the national teamai??i? ?s progress however only makes sense when we consider the context the rest of the country is submerged in. The optimism surrounding the national football team since the start of the 2010 World Cup qualifying campaign which began in 2008, has been the only shining light in the country plagued by problems such as high unemployment (currently at 45%), a stagnating economy, ever present political corruption, divisive ethnic politics and a long-lasting dream of EU membership that is just as distant now as it was back in 2008. A lady makes her way along the village road with her son who wears a football shirt bearing the name of the man who was carrying the hopes of an entire nation on the world stage for the first time in their history. DA?eko, for his part did his best to help out the affected people and he even took a break from World Cup training to play a charity game for flood victims along with his national team-mates. He is a national idol. When DA?eko scores, it seems every Bosnian refugee in the world has scored with him. When Bosnia look at their great players, Edin DA?eko stands out not just because of his qualities and his world popularity, but because of his journey that saw him rise through all the hardships that and become a Bosnian great. But he stayed the same genuine, kind and straightforward guy ai??i?? and therein lies the beauty of his greatness. Many players of the present squad lived through the war in one way or the other. Dzeko cheated death by a whisker when his mother refused to let him go to a Sarajevo playground where later on that same day many children lost their lives in a powerful explosion. Bosnian striker Vedad IbiA?evic, who plays his club football in Germany with Stuttgart scored the decisive goal in the qualifiers against Lithuania that took Bosnia through to the finals in Brazil. IbiA?evic, who spent his childhood as a refugee in St Louis, was forced to flee his home town in 1992. His father and uncle were killed in the war while the villages of his parents were razed. He was among the few lucky souls who secured a seat on a bus to Tuzla in Bosnian republic-controlled territory, then had to walk the last of the phase of the journey on foot, past corpses scattered along the road. Haris Medunjanin of Gaziantepspor is another one who lost his father in the war and then moved to Holland with his mother. Bosnia represented their country on the world stage behind an unusually united population. Football will never be a substitute for reforms which the country direly needs now but the focus of international media will undoubtedly bring recognition to the desperately serious situation in Post-Dayton Bosnia. No World Cup can replace the burning social issues like joblessness, poverty, and underlying ethnic tensions predominant in every corner of the country. The happiness and excitement the Dragons have brought to Bosnia and Herzegovina irrespective of their first round exit after years of pain and struggle is very well-deserved and long, long overdue for the Bosnians. They had an exceptional and loyal fan-base who regularly filled the stadium in every home game and even outnumbered the home fans in away games. They were an integral part of the team. And perhaps the root cause of their joy was the underlying pain. From the painful events of the past, they draw inspiration and solidarity with one another. They suffered through two playoff defeats to Portugal but never abandoned their team. They enjoyed every Misimovic free-kick, every through pass of Pjanic, every header of Edin Dzeko header, every Ibisevic goal- no matter the emotional toll it took. It was worth it, because it was their own team with whom they could recognize themselves with. Dzeko and his team mates have already made history. The history of the Dragons bears witness to the long and stormy struggle of Bosnians to control their own destiny. The national team has always been a powerful symbol of Bosnian identity. The World Cup lasted for only for two weeks while other burning factors of inter-ethnic relations (such as divisions in school system, nationalistic media always looking to create trouble, the highly controversial Dayton political system etc) will continue to exist. The World Cup (as the opium of the masses) has the potential to temporarily heal some of the old wounds, bring the people together under one roof and present Bosnia-Herzegovina in a positive way. However, this should not be an illusion about unified Bosnian society ai??i?? the reality is that they are still far from a reconciled Bosnia.